FILE - Russian Foreign Minister Sergey Lavrov, right, and his Afghan counterpart Salahuddin Rabbani shake hands after their meeting in Moscow, Russia, Feb. 7, 2017. With the Trump administration still stitching together its foreign policy, priorities and staff, Russia seems intent on expanding its once-shrunken sphere of influence by exploiting gaps in America's overseas presence. It's been a globe-spanning effort, with Russian leader Vladimir Putin using muscle in places like Ukraine and Syria and offering sweeteners to potential allies that he hopes will pay off later. The focus is on countries that have shaky ties with Washington, are strategically located or have abundant natural resources. A key issue is how Putin's relationship with new President Donald Trump will pan out. Can two cocky personalities truly be allies against common foes like Islamic State, which could usher in a new era of cooperation? Are the distrust and animosity that festered during the Cold War too much to overcome? And will there be long-term fallout over Russia's efforts to bolster Trump's election campaign? 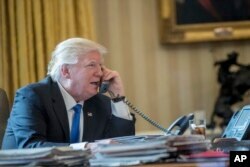 FILE - President Donald Trump speaks on the phone with Russian President Vladimir Putin, Jan. 28, 2017, in the Oval Office at the White House in Washington. Russia's influence, which rivaled that of the United States during the Cold War, faded dramatically after the fall of communism and the breakup of the vast Soviet Union. But under Putin, it has sought to re-establish itself in an effort that has stretched from the North Sea to Antarctica. In its latest initiative, Russia seeks to transform itself from an erstwhile warmonger in Afghanistan, during its failed decade-long invasion, into a peacemaker. On Wednesday, Moscow hosted a second-round of peace talks on the resource-rich country. Afghanistan, Pakistan, Iran, India and China were invited. The United States was conspicuously left out, despite its ongoing military intervention to repel Islamic terrorists and put Afghanistan solidly on the road to stability. Afghanistan watchers in the region say Moscow wants to play a more active role closer to home after its actions in Syria. "Russia has created a role for itself in the Middle East, particularly in Syria, and has carried out effective operations against Daesh [Islamic State]," said Rahimullah Yousafzai, a noted Pakistani journalist who has written extensively on Afghanistan and the Taliban. FILE - Boxes of ammunition are seen inside a Russian aircraft at the International Kabul Airport, Afghanistan, Feb. 24, 2016. 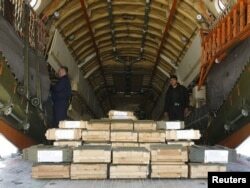 Afghan officials took delivery of 10,000 automatic rifles and millions of rounds of ammunition as a gift from Russia. "Russia will definitely be part of negotiations for peace or cease-fire" in Syria, Yousafzai told Voice of America's Deewa Pashto service. "Now it seems Russia wants to be included in any consultations in the neighborhood, and they seem to have been successful to a great extent." The United States, China and Russia have interests in Afghanistan, some of which might pit them against one another. But Yousafzai said fighting against Islamic State could potentially be a common cause. "I think they can be each other's allies in the fight against Daesh," Yousafzai said, using a common Arabic name for the group. However, Russia has forged ties with Afghanistan's rebel Taliban movement, seeing them as an ally against Islamic State, and that has put it at odds with Washington. Moscow claims it's just trying to foster peace; the U.S. says Russia's aid is helping the Taliban to wage its war against the U.S.-backed government in Kabul. Russia's intervention in Afghanistan may be driven in large part by its desire to stop the spread of Islamist extremism through the Muslim Central Asian states and the flow of narcotics from poppy-producing Afghanistan, said Sami Yousafzai, an Afghan correspondent who has been reporting for several international media organizations. But the landlocked country also is strategically located, which was a major factor in Russia's 1979 invasion. Cozying up to Moscow might not yield the Taliban the benefits of international legitimacy or consideration as a political force within Afghanistan because Russia does not have a very influential global role and has angered many Sunni-Muslim states in the Middle East with its support for Shi'ite Iran, said Sami Yousafzai, who is not related to Rahimullah Yousafzai. 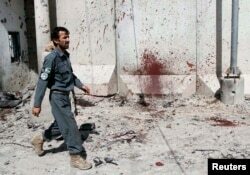 FILE - An Afghan policeman walks past a bloodstained wall after Taliban fighters stormed a government compound in Kandahar province, July 9, 2014. "If Taliban want to be recognized as a political power at the international level, if they want to have a political stand, they need to have backing by the U.S. and NATO," he said. The interest in Afghanistan only scratches the surface of Moscow's interest and mirrors China's aggressive efforts to build up its presence in the South China Sea. Some see the possibility of limited cooperation between Moscow and Beijing to counterbalance U.S. influence. Both have been taking advantage of a relatively hands-off approach to foreign policy in some areas under former President Barack Obama. Russia has been accused of political meddling across the Balkans, reportedly countering U.S. interests to the point of disruption. Moscow donated weapons and other military hardware a year ago to the Pacific nation of Fiji, which has been developing new allies after being isolated by sanctions for its military coup in 2006. "It strikes me that we could see, in 10 or 15 years, regular visits by Russian naval ships to Suva," Paul Buchanan, director of 36th Parallel Security Assessments, told The Guardian. "And perhaps in 20 years, China and/or Russian being granted forward basing rights in Fiji." Russia also has been cultivating a relationship with Libya, which could lead to cooperation with Washington or could develop into a point of conflict. And Moscow has been bolstering its presence as far away as Antarctica, which is believed to have vast stores of natural resources, while pursuing interests in the Arctic as the melting icecap provides access to previously blocked areas. VOA's Deewa Pashto Service contributed to this report.